Go to original pattern for design DROPS 113-34. DROPS jacket in ”Symphony” with ¾ sleeves, wide front bands and rolling edges. Size S – XXXL. 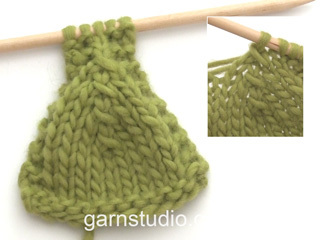 DROPS POINTED NEEDLES size 6 mm – or size needed to get 15 sts x 20 rows in stocking st = 10 x 10 cm. DROPS Mother-of-pearl buttons no 540: 2 pcs. Cast on 60-66-72-80-88-96 sts (includes 1 edge st each side) on needle size 6 mm with Symphony. Work 4 rows stocking st (first row = WS), K 1 row from WS and continue in stocking st. REMEMBER THE KNITTING TENSION! When piece measures 5 cm dec 1 st each side and repeat the dec when piece measures 10 and 15 cm = 54-60-66-74-82-90 sts. When piece measures 20-21-22-23-24-25 cm inc 1 st each side, and repeat the inc on every 3 cm a total of 5 times = 64-70-76-84-92-100 sts. 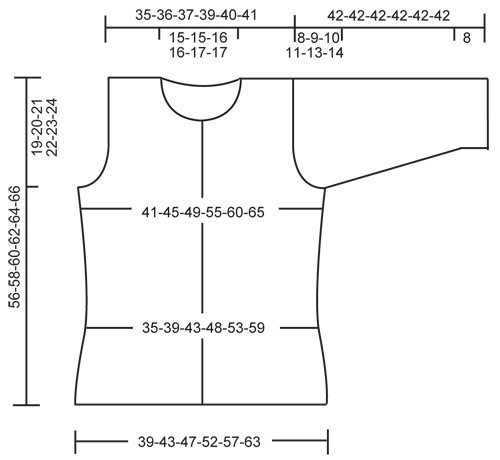 When piece measures 37-38-39-40-41-42 cm cast off for armhole each side at the beg of every row: 3 sts 1-1-1-1-2-2 times, 2 sts 0-1-2-3-3-4 times and 1 st 3-3-3-4-4-5 times = 52-54-56-58-60-62 sts left on row. When piece measures 54-56-58-60-62-64 cm cast off the middle 20-20-22-22-24-24 sts for neck and complete each shoulder separately. Cast off 1 st on neckline on next row = 15-16-16-17-17-18 sts left on shoulder. Cast off when piece measures 56-58-60-62-64-66 cm. Cast on 24-27-30-34-38-42 sts (includes 1 edge st at the side) on needle size 6 mm with Symphony. Work 4 rows stocking st (first row = WS), K 1 row from WS and continue in stocking st. When piece measures 5, 10 and 15 cm dec at the side as described for back piece = 21-24-27-31-35-39 sts. When piece measures 20-21-22-23-24-25 cm inc at the side as described for back piece = 26-29-32-36-40-44 sts. When piece measures 37-38-39-40-41-42 cm cast off for armhole at the side as described for back piece = 20-21-22-23-24-25 sts. When piece measures 46-48-50-52-54-56 cm cast off 2 sts towards mid front for neck and cast off to shape the neckline on every other row: 1 st a total of 3-3-4-4-5-5 times = 15-16-16-17-17-18 sts left on shoulder. Cast off when piece measures 56-58-60-62-64-66 cm. FRONT BAND: Pick up approx 70-72-75-78-81-84 sts from RS inside 1 st along front piece on needle size 6 mm. K 1 row from WS and continue in stocking st with 1 garter st each side. When front band measures 5 cm make 2 buttonholes, place the top one 2 cm from neckline and the other 10 cm from the first one. 1 buttonhole = cast off 2 sts and cast on 2 new sts on return row. When front band measures approx 9 cm K 1 row from WS and cast off loosely. Like right front piece, but mirrored and without buttonholes on front band. 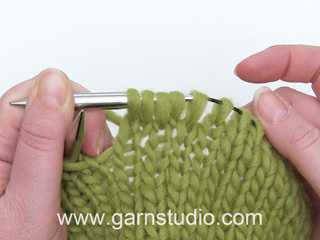 SLEEVE: Cast on 44-46-48-50-52-54 sts (includes 1 edge st each side) on needle size 6 mm with Symphony. Work 4 rows stocking st (first row = WS), K 1 row from WS and continue in stocking st. When piece measures 8 cm inc 1 st each side and repeat the inc on every 6-5-4-3.5-3-2.5 cm a total of 5-5-6-7-7-8 times = 54-56-60-64-66-70 sts. When piece measures 34-33-32-31-29-28 cm (less for the larger sizes because of longer sleeve cap and wider shoulder) cast off for sleeve cap each side at the beg of every row: 3 sts 1 time, 2 sts 2 times and 1 st 2-3-4-5-7-8 times, then 2 sts each side until piece measures 41 cm, now cast off 3 sts each side 1 time and cast off remaining sts. Piece measures approx 42 cm. NECKLINE: Pick up approx 70 to 80 sts from RS round neckline on needle size 6 mm. K 1 row from WS and then work 4 rows stocking st, cast off loosely. Set in sleeves and sew side and sleeve seams inside 1 edge st. Sew on buttons. Buongiorno Tiziana. Il bordo dei bottoni viene lavorato riprendendo le maglie lungo il lato. In tutto il bordo è alto 9 cm. Per aprire le asole deve intracciare 2 maglie (per ogni asola). Al ferro successivo, avvia due nuove maglie sopra quelle intrecciate. Buon lavoro! Bonjour, Je trouve cette veste très jolie ,la laine utilisée pour le modèle n'existe +,par quelle laine je peux la remplacer?. Bonjour Mme Vergobbi, vous trouverez ici comment remplacer Symphony (laine du groupe D). Bon tricot! I would like to substitute the melody yarn for the symphony and notice the yardage is double. Meaning I only need half the amount. Is this correct?? Confused please help. Dear Mrs Sherwin, that's right, Symphony was 70 m for 50 g while Melody is 140 m for 50 g. Try our yarn converter to calculate new amount of yarn you need in your size. Happy knitting! Liebe Frau Keller, am Ende der Seite finden Sie eine Maßskizze mit allen Maßen für jede Größe. Vergleichen Sie diese Maßen mit einer ähnliche Jacke, die Sie gerne haben, um die passende Größe zu finden. Hier lesen Sie mehr. Viel Spaß beim stricken! The beginning says stockinette stitch 1st row is the Wrong side...does this mean I start with a purl row, or are there 4 rows of "reverse stockinette stitch" as the band and then switch to regular? Dear Annette, you are working first 4 rows in stocking st starting with P on 1st row (from WS) then K on 2nd row (RS), P on 3rd row and K on 4th row, then work 1 row K from WS and continue in stocking st: K from RS (on next row) and P from WS. Happy knitting! Dear Cindy, Symphony is now discontinued, you can use Melody as an alternative. Happy knitting! Buongiorno. Il filato suggerito consente di realizzare capi molto morbidi e leggeri. E' possibile usare i filati Nepal e Big Merino. Questi filati hanno però una consistenza maggiore e sono più compatti, pertanto il capo risulterebbe più "sostenuto". E' comunque importante che il campione corrisponda con quello indicato nel modello. Buon lavoro! Bonjour Liva, pour les emmanchures, on a en taille S 64 m et on diminue : 1 fois 3 m (x 2 côtés) = 6 m puis 3 fois 1 m (x 2 côtés) = 6 m ; soit un total de 12 m, 64 -12 = 52 m.
Les diminutions pour l'emmanchure me pose problème:si je diminue de chaque cote 1-1-1-1-2 puis 2fois 3m,cela fait 24 m et non 12m, donc il me reste 64m-24m=40m et non 52m. Où me suis-je trompée? Wow! Everything your designers create are things of beauty! I wish Americans had half your talent!